Here is the list of the hotels near Tautavel. Book your hotel near Tautavel today, Tuesday 14 May for the best price, reservation and cancellation free of charge thanks to our partner Booking.com, leader in on-line hotels reservation. Below here is the list the 50 closest hotels of Tautavel, sortable according your criteria. You will find the position of these accommodations on the Tautavel hotels map. Situated 300 metres from Tautavel Museum, the European Center of Prehistory and surrounded by vineyards, Gîtes - L’Abri sous Roche offers self-catering accommodations. After a long day of sightseeing, you can rest on the sofa bed using free Wi-Fi access. The accommodations at Gîtes - L’Abri sous Roche have a bathroom fitted with a bathtub or a shower. The one-bedroom apartment includes a flat-screen TV with cable channels and a DVD player. The kitchens provide a coffee machine, a toaster and a microwave. Guests can also request a meal on site. Bars, grocers and restaurants can be found within a walking distance. Port-Leucate Beaches are 40 km away. It is located 33 km from Perpignan Train Station and 25 km from Perpignan Airport. Surrounded by vineyards, L’Abri sous Roche is located in Tautavel, just 300 metres from the European Centre of Prehistory. Guests are free to use the B&B’s Wi-Fi connection or enjoy a hot drink in the lounge. The guest rooms at L’Abri sous Roche are individually decorated and include a flat-screen TV. Each room has a fan or air conditioning, and its own private bathroom with a hairdryer. Breakfast is served daily on the terrace or in the dining room and includes fresh bread, homemade cake and jam. Other meals can be prepared upon request and bars and restaurants are found in the centre of Tautavel. Free public parking is available on site and Caune de l’Aragó is just 3 km away. The property is a 30-minute drive from Perpignan and 30 km from the Mediterranean Sea. Featuring a seasonal outdoor swimming pool and free WiFi, L'Ile aux Mimosas features accommodation in Tautavel. Some units have a seating area and/or a terrace. Guests can also relax in the garden. Perpignan is 34 km from the bed and breakfast, while Collioure is 63 km from the property. Perpignan - Rivesaltes Airport is 27 km away. 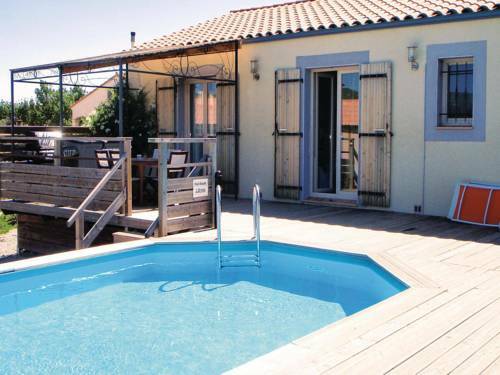 Set in Vingrau, Domaine Vents Du Sud offers free WiFi and units fitted with a kitchen, seating area and flat-screen TV. An oven and microwave are also available, as well as a coffee machine. The holiday home offers a seasonal outdoor pool. This property features a barbecue. Perpignan is 28 km from Domaine Vents Du Sud, while Caves is 30 km from the property. The nearest airport is Perpignan - Rivesaltes Airport, 22 km from the property. Situated in Paziols, Four-Bedroom Holiday Home in Paziols offers accommodation with a private pool and private parking. Free WiFi is provided. The 4-bedroom holiday home comes with a living room with TV and DVD player, and a fully equipped kitchen. The holiday home offers an outdoor pool. Perpignan is 40 km from Four-Bedroom Holiday Home in Paziols, while Caves is 41 km away. Perpignan - Rivesaltes Airport is 33 km from the property. Offering free WiFi and city views, Duplex is an accommodation located in Estagel. Guests staying at this apartment have access to a fully equipped kitchen. The apartment has a flat-screen TV, 2 bedrooms and a living room. The apartment also offers a seating area and 1 bathroom. Perpignan is 25 km from the apartment, while Argelès-sur-Mer is 47 km away. The nearest airport is Perpignan - Rivesaltes Airport, 18 km from Duplex. L'Ancienne Gendarmerie offers accommodation with a garden and free WiFi, and is situated in Tuchan. All units are equipped with a microwave, toaster, a coffee machine, a fridge and kettle. Some units also have a kitchenette equipped with a stovetop. Guests at the bed and breakfast can enjoy a continental breakfast. L'Ancienne Gendarmerie offers a terrace. If you would like to discover the area, cycling and hiking are possible in the surroundings. Perpignan is 40 km from the accommodation, while Caves is 37 km away. The nearest airport is Perpignan - Rivesaltes Airport, 33 km from L'Ancienne Gendarmerie. Located in Tuchan, Le Relais d'Aguilar features accommodation with a seating area, a TV and a kitchen. Free WiFi is available. A terrace with mountain views is offered in every unit. A continental or buffet breakfast is available each morning at the property. Carcassonne is 80 km from the camping, while Perpignan is 40 km from the property. The nearest airport is Perpignan - Rivesaltes Airport, 33 km from the property. Guest accommodation Tuchan Preferred hotel ! Offering a seasonal outdoor pool, barbecue and sun terrace, Le Couvent is situated in Tuchan in the Languedoc-Roussillon Region. Free WiFi is offered. Views of the mountains, pool or garden are featured in certain rooms. A TV is provided. Reiki therapy is offered at the property upon request. Parking spaces for motorbikes and bikes are available on site free of charge. Perpignan is 41 km from Le Couvent, while Narbonne is 49 km from the property. The nearest airport is Perpignan - Rivesaltes Airport, 33 km from the property. Holiday Apartment Baixas 05 is situated in Baixas. The accommodation is 13 km from Perpignan. This apartment has 2 bedrooms, a living room and a fully equipped kitchen with an oven. A TV is featured. Collioure is 42 km from the apartment, while Argelès-sur-Mer is 36 km away. The nearest airport is Perpignan - Rivesaltes Airport, 6 km from the property. Holiday Apartment Baixas 06 is set in Baixas. Guests staying at this apartment have access to a fully equipped kitchen. The apartment has a TV, 2 bedrooms and a living room. Perpignan is 13 km from the apartment. The nearest airport is Perpignan - Rivesaltes Airport, 6 km from the property. Holiday Apartment Baixas 04 is located in Baixas. Guests staying at this apartment have access to a fully equipped kitchen. The property includes a living room with a TV. Perpignan is 13 km from the apartment, while Collioure is 42 km away. The nearest airport is Perpignan - Rivesaltes Airport, 6 km from the property. Holiday Apartment Baixas 08 is situated in Baixas. Guests staying at this apartment have access to a fully equipped kitchen. The apartment has a TV and a living room. Perpignan is 13 km from the apartment. Perpignan - Rivesaltes Airport is 6 km away. Holiday Apartment Baixas 02 is located in Baixas. Guests staying at this apartment have access to a fully equipped kitchen. The apartment comes with a TV, 1 bedroom and a living room. Perpignan is 13 km from the apartment, while Collioure is 43 km from the property. The nearest airport is Perpignan - Rivesaltes Airport, 6 km from the property. Holiday Apartment Baixas 03 is set in Baixas. Guests staying at this apartment have access to a fully equipped kitchenette. The apartment features a TV and 2 bedrooms. Perpignan is 13 km from the apartment, while Collioure is 43 km away. The nearest airport is Perpignan - Rivesaltes Airport, 6 km from Holiday Apartment Baixas 03. Holiday home Tuchan 56 is set in Tuchan. This holiday home also has a private pool. The holiday home includes 3 bedrooms and a living room with a TV. The holiday home offers an outdoor pool. Perpignan is 40 km from Holiday home Tuchan 56, while Caves is 37 km from the property. The nearest airport is Perpignan - Rivesaltes Airport, 33 km from the property. Located in Tuchan, Holiday home Tuchan 57 features accommodation with a private pool. Guests staying at this holiday home have access to free WiFi. The holiday home features a TV and 2 bedrooms. The holiday home offers an outdoor pool. Perpignan is 40 km from Holiday home Tuchan 57, while Caves is 37 km from the property. The nearest airport is Perpignan - Rivesaltes Airport, 33 km from the property. Gîte Château Cathare is set in Padern. The property features mountain views and is 48 km from Perpignan. The holiday home has 2 bedrooms, a living room, and a kitchen with a dining area. Caves is 45 km from the holiday home. The nearest airport is Perpignan - Rivesaltes Airport, 41 km from Gîte Château Cathare. Hotel Rivesaltes Preferred hotel ! The Tropic is located 12 km north of Perpignan. It provides air-conditioned accommodation with free WiFi and offers free access to the seasonal hot tub and outdoor swimming pool. Each guest room at Hotel Tropic is equipped with a TV and en suite facilities. A buffet breakfast is served daily. Guests can enjoy traditional dishes such as Paëlla at the Tropic’s restaurant. The Tropic Hotel offers free on-site parking and the A9 motorway is 2 km away. The nearest beach is just 10 km away. Located in Rivesaltes, La Tour Du Terroir provides accommodation with access to a garden. Complimentary WiFi is offered. There is a fully equipped private bathroom with shower and a hair dryer. A continental breakfast is available daily at the bed and breakfast. La Tour Du Terroir offers an outdoor pool. This property offers a terrace. Perpignan is 12 km from the accommodation, while Collioure is 41 km away. The nearest airport is Perpignan - Rivesaltes Airport, 5 km from the property. Set in Rivesaltes, L'Orangerie offers a garden. Each accommodation at the 3-star guest house has garden views and free WiFi. Each room comes with a patio. The units at the guest house are equipped with a seating area. The private bathroom is equipped with free toiletries. All guest rooms feature a wardrobe. A continental breakfast is available every morning at L'Orangerie. Cycling is among the activities that guests can enjoy near the accommodation. Perpignan is 12 km from L'Orangerie. Perpignan - Rivesaltes Airport is 5 km away. Offering a sun terrace, Le Presbytère has accommodation with a patio and free WiFi. Located in Rivesaltes, it includes a free shuttle. Each room and apartment here will provide you with a private bathroom featuring a hairdryer. The apartments also come with a fully equipped kitchenette. Perpignan can be reached in 15 minutes by car. Le Presbytère is 17 km from the seaside. Featuring free WiFi and a sun terrace, La Tour De L'horloge is an old townhouse in the historic centre of Rivesaltes, in a pedestrianised zone. Guests can enjoy a drink in the on-site bar. Perpignan is 11 km away and the nearest beach is 17 km away. Each individually decorated room is fitted with a flat-screen TV and has a private bathroom. For your comfort, you will find free toiletries and a hairdryer. You will find a shared lounge at the property. The area is popular for cycling and fishing. The nearest airport is Perpignan - Rivesaltes Airport, 4.2 km from La Tour De L'horloge. Set in Rivesaltes, ma chambre d'hôtes à Rivesaltes has a terrace and a bar. All rooms feature a kitchenette, a flat-screen TV with cable channels, and a private bathroom. The accommodation features free shuttle service and a 24-hour front desk for guests. At the guest house, every room has a balcony with a city view. Guest rooms will provide guests with a microwave. A continental breakfast is available each morning at the property. The area is popular for cycling and hiking. Perpignan is 12 km from ma chambre d'hôtes à Rivesaltes. Perpignan - Rivesaltes Airport is 6 km from the property. La Chambre d'Opoul is set in Opoul-Périllos and offers a garden and a terrace. Free WiFi is offered. The bed and breakfast is equipped with a flat-screen TV. Fishing can be enjoyed nearby. Perpignan is 24 km from the bed and breakfast, while Argelès-sur-Mer is 47 km from the property. The nearest airport is Perpignan - Rivesaltes Airport, 20 km from the property. Set in Pézilla-la-Rivière, Holiday Home Pezilla la Riviere with Fireplace II provides accommodation with a private pool and free WiFi. Guests may go for a swim in the outdoor pool. This holiday home has 3 bedrooms, a living room and a fully equipped kitchen. A TV is featured. Perpignan is 13 km from the holiday home, while Collioure is 43 km away. The nearest airport is Perpignan - Rivesaltes Airport, 15 km from Holiday Home Pezilla la Riviere with Fireplace II. Bed and Breakfast Baho Preferred hotel ! Located just 8 km from Perpignan, Le Mas Del Cavalier offers an outdoor swimming pool, garden, terrace and pool house. The beach is a 25-minute drive away. All rooms are air-conditioned and feature a private terrace with garden views, a flat-screen TV, iPod docking station and tea and coffee making facilities. The en suite bathroom includes free toiletries. A continental breakfast is provided each morning at Le Mas Del Cavalier. Guests can also sample traditional cuisine in a meal prepared by the hosts, upon request. Additional features include a communal living room and kitchen, table tennis, football table and free Wi-Fi access. Wine cellars and tasting can be found 10 km away and Villeneuve-de-la-Raho Lake is a 25-minute drive from the property. Situated in Salses-le-Chateau, Camping Le Bois De Pins features accommodation with free WiFi. All units include a fully equipped kitchenette, allowing guests to prepare their own meals. A microwave and fridge are also available, as well as a coffee machine. A continental breakfast is available daily at the property. Perpignan is 19 km from the camping. The nearest airport is Perpignan - Rivesaltes Airport, 17 km from Camping Le Bois De Pins. Kyriad Perpignan Nord is located just off the A9 motorway and a 10-minute drive from the centre of Perpignan. It offers free parking and a games room with both billiard tables and arcade-style games. The air-conditioned rooms at Kyriad Perpignan Nord are contemporary in style and include an LCD TV with satellite and cable channels. Each one also features free Wi-Fi access and an en suite bathroom with free toiletries. You can enjoy hot drinks and French pastries off the buffet breakfast in the dining room. There is also a restaurant just next to the hotel for lunch and evening meals. Additional facilities at this hotel include a shoe shine service and a 24-hour reception. Perpignan-Rivesaltes Airport is 9 km away and the beach at La Barcarès is just 12 km from the property. Campanile Perpignan Nord – Rivesaltes is located at exit 41 from motorway A9, just 10 minutes' drive from the Perpignan-Rivesaltes Airport. It offers comfortable rooms and free Wi-Fi. Rooms have feather beds, canal+ satellite TV with a flat-screen and a bathroom with bathtub. There are also rooms for the disabled. This new generation hotel offers a terrace and an outdoor swimming pool. There is a quality restaurant onsite and a full breakfast is served daily. Campanile Perpignan Nord is close to Spain and Andorra as well as the beach and the ski slopes of the Pyrénées. This hotel, set near the motorway exit, is an ideal starting point from which to visit the town of Perpignan and the nearby area. The highest levels of comfort await you in the 54 air-conditioned rooms of the Première Classe Perpignan Nord - Rivesaltes. All rooms come with a work area, an en-suite shower and a television with built-in alarm. Get off to a good start and enjoy a copious and healthy buffet breakfast each morning. The on-site restaurant is accessible on foot. Ibis Budget Perpignan Nord is an air-conditioned hotel located in Rivesaltes in the heart of the vineyards. Perpignan is 9km away and the beaches can be found 12 km from the hotel. Free WiFi access is available. At Ibis Budget Perpignan Nord you will find a 24-hour front desk, a garden and a terrace. Other facilities offered at the property include a vending machine. Breakfast is available on site. A restaurant can be found 200 metres from the property, and a shopping centre is only 1 km away. Perpignan - Rivesaltes Airport is 5 km away. The property offers free private parking. This hotel is located 10 minutes from Perpignan and the beaches. 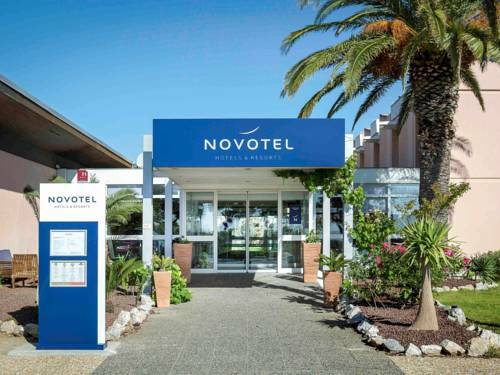 Novotel Perpignan offers 56 air-conditioned rooms as well as the Novotel Café bar restaurant with meals served 24 hours a day. A number of meeting rooms are available for holding your functions and conferences. With our outdoor swimming pool and pine forest gardens, we invite you to come and visit Perpignan for a weekend or for a few days on a family holiday. Secure private parking is also available to guests. Up to 2 children (15 years and under) stay free when sharing with parents. Located in Salses-le-Chateau in the Languedoc-Roussillon region, Petite Chouette has a terrace. Guests staying at this holiday home have access to a fully equipped kitchenette. This 1-bedroom holiday home includes 1 bathroom equipped with a shower. Perpignan is 18 km from the holiday home, while Collioure is 47 km from the property. The nearest airport is Perpignan - Rivesaltes Airport, 15 km from Petite Chouette. Chouette escale is located in Salses-le-Chateau. Guests staying at this holiday home have access to a fully equipped kitchen. Leading onto a terrace, the holiday home consists of 1 bedroom. Perpignan is 18 km from the holiday home. The nearest airport is Perpignan - Rivesaltes Airport, 15 km from the property. Holiday home Avenue Francois Tubeau is set in Salses-le-Chateau and offers barbecue facilities. Guests staying at this holiday home have access to a fully equipped kitchen. The holiday home has a satellite TV and 2 bedrooms. Perpignan is 17 km from the holiday home. The nearest airport is Perpignan - Rivesaltes Airport, 15 km from Holiday home Avenue Francois Tubeau. Situated in Villeneuve-la-Rivière, Chambres Table d'hotes Carpe diem features accommodation with a seasonal outdoor pool and a garden. Complimentary WiFi is featured. There is a private bathroom with shower in all units, along with free toiletries and a hair dryer. A continental breakfast can be enjoyed at the property. Guests can grab a bite to eat in the on-site restaurant, which serves a variety of Spanish, Grill Bbq and Mediterranean dishes. The bed and breakfast offers a children's playground. This property offers a terrace. Perpignan is 9 km from Chambres Table d'hotes Carpe diem, while Collioure is 38 km away. The nearest airport is Perpignan - Rivesaltes Airport, 11 km from the accommodation. Hotel Perpignan Preferred hotel ! Located just 5 km from Perpignan Airport, B&B Hôtel PERPIGNAN Nord Aéroport offers a terrace with garden furniture, a 24-hour front desk and free WiFi access. This hotel is on a secured property with free private parking. The guest rooms are furnished with a desk, wardrobe, flat-screen satellite TV and ironing facilities. Each has a private bathroom with a shower, hairdryer and free toiletries. A buffet breakfast is served daily and there is a vending machine on site with beverages and snack foods. Restaurants can be found 200 metres away. Guests can visit Canet and Rousillon beaches, both 16 km away and the Spanish border is a 30-minute drive away. Perpignan Train Station is 7 km away and there is a bus that stops 100 metres from the property. Located in the centre of Millas, La Gare De Millas offers self-catering accommodation just 19 km from Perpignan. The property also features a terrace, garden and outdoor furniture, and free Wi-Fi is available throughout. This air-conditioned rooms feature a TV and fireplace. The private bathroom offers a shower, toilet and free toiletries. A continental breakfast comprising hot drinks, juices, local fruits and homemade breads is served daily. Bars and restaurants can be found in the centre of Milllas. La Gare De Millas is situated 37 km from Le Barcares beach and 43 km from the Spanish border. Perpignan Airport can be reached in 20 minutes by car. Below here is the hotels map of Tautavel. Names and details of Tautavel hotels can be shown on the map clicking on the prices icons.